The world’s ugliest animal speaks up. 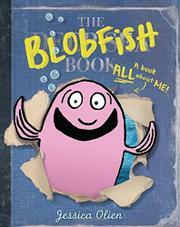 In the tradition of Kelly Bingham and Paul O. Zelinsky's Moose and David Ezra Stein’s Interrupting Chicken, Blobfish takes over a book about deep-sea creatures, inserting itself into every page. A straightforward text about deep-sea life, a sentence or two set on a background of photographs, is interrupted on every double-page spread by an impatient cartoon blobfish and its own commentary. When its photograph finally appears, the text notes that it “was once voted the world’s ugliest.” Naturally, its feelings are hurt. At this point, the other animals—viperfish, jellyfish, jewel squid, anglerfish, blenny fish, giant spider crab, and northern stoplight loosejaw—acquire speech bubbles too, banding together to make their own crayoned page with a message of support. The humor is grand, the informational value modest. Olien has juxtaposed creatures that may live far apart in real life. On a diagram of ocean zones (with only English measurements), Blobfish points to the 13,000-foot line between the bathypelagic and abyssopelagic zone to show where he lives “in the deep, deep part”; since there is yet another zone below 20,000 feet, readers will wonder exactly what “deep, deep” means. Moreover, in truth, blobfish seem to live around 2,000-4,000 feet down. They also probably look quite different at their proper depth; the photo in the book was taken at the surface. Further facts and suggestions for websites to explore are added in the backmatter. HELLO MY NAME IS . . .